If you follow me on my social media, you may know that I had a little upgrade done to my house recently. I got new floors! Our carpet was so so so bad. Our house is 10 years old this year, and so is the carpet. So, with it's condition, it only made sense to upgrade it. It especially got bad when our late dog was at the end of his life, and couldn't control anything :/ It was pretty hard to keep up with the cleaning! I'll save you the details and pictures of how gross our carpet really got! 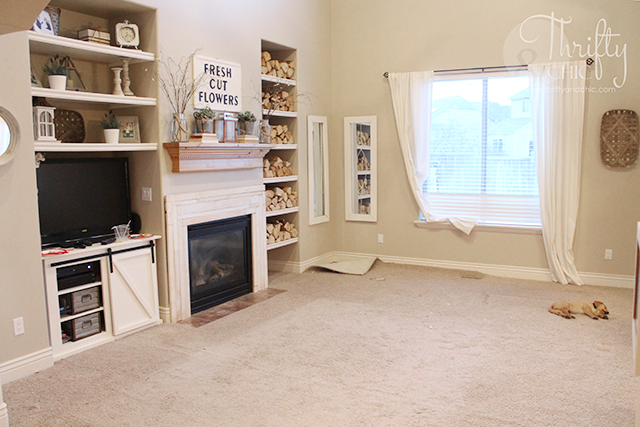 Plus, our carpet was in desperate need of being stretched, so there was little bunches everywhere. Here's a shot of the carpet right when we started to pull it up. 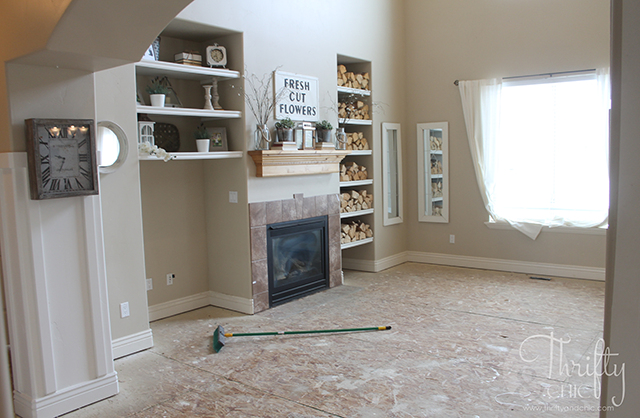 I remember thinking about how large this room looked without furniture! It's crazy! 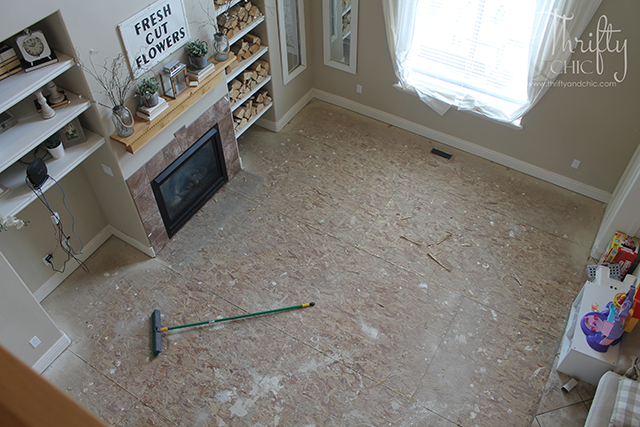 We ended up only replacing the carpet on our first story with laminate, leaving the tile in the dining room, kitchen and bathrooms. The decision for this was cost. And truthfully, I didn't have any desire to rip up or pay $2,000 for someone to rip up my tile. And then came the matter of the baseboards. We would have to take off all our baseboards in the rooms with tile. 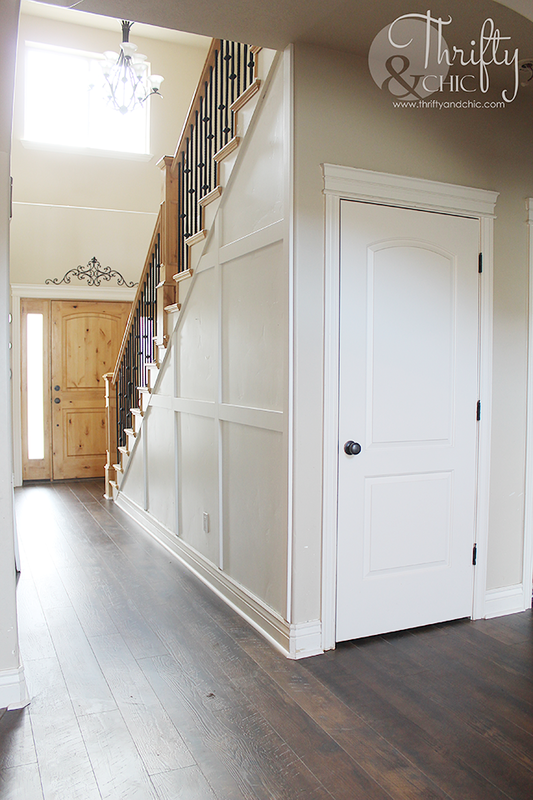 We have custom baseboards, so if we ruined one, then it would be pretty hard to find another one like it. That being said, there would be a high possibility of having to replace all the baseboards, which added to the cost. We did go the route of having it installed by a company. I knew that if my husband and I did it, it would be a marriage ender :) We don't do projects well together. Plus, instead of 2 days, it would take us like 3 months. 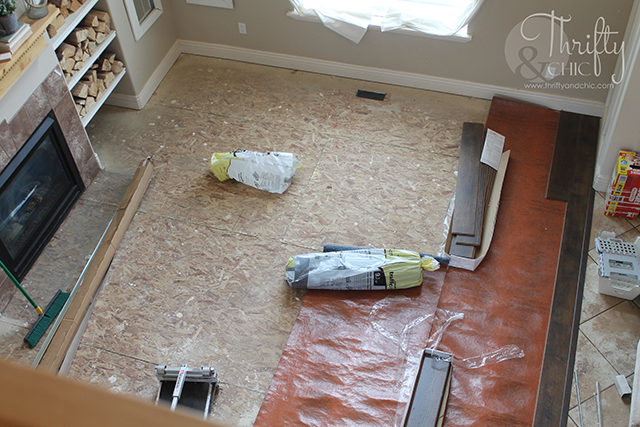 So, to get it ready of the installers, we ripped up all the carpet and padding. This part was seriously so gross. Especially looking at the bottom of the carpet. All those stains will haunt me! The worst part of doing all of this was pulling up the tack strips and pulling all the staples out. That took hours to do! Sweeping up was pretty gross too. I'm not sure if it was all sand, or dust, or skin particles. But there was a lot! 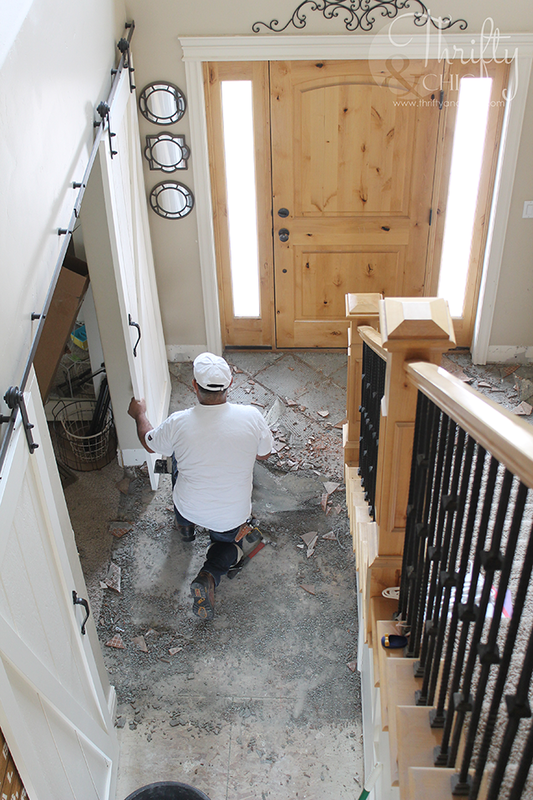 We had the installers do the demo of the tile in our entry way and fireplace. And I'm sure glad we did after watching him. It didn't cost much for them to do it, so I figured we might as well. I was actually sad to see that tile go. I had come to love it over the years. Here's a pretty old picture, but it shows what it used to look like from up above. And then with it all gone. We also took out the carpet in our bedroom. We really didn't need to, but thought it made the most sense to keep the floor flowing throughout it. As for the furniture? I got asked a lot about what we did with it. I had a picture and can't find it! I even had a video and it was lost. But, it was seriously like playing tetris. We had everything from our bedroom, entry way and living room in our dining room and kitchen. Luckily, we didn't have to live like that for more than a couple of days. We did end up sleeping on a mattress on the subfloor for one night, which was fun :) Kind of like glamping. Here's the start to the process. You can see here where we did the transition from the tile to the laminate. That brings me to why we chose laminate. We had a long discussion between real wood and laminate. And it all came to durability. 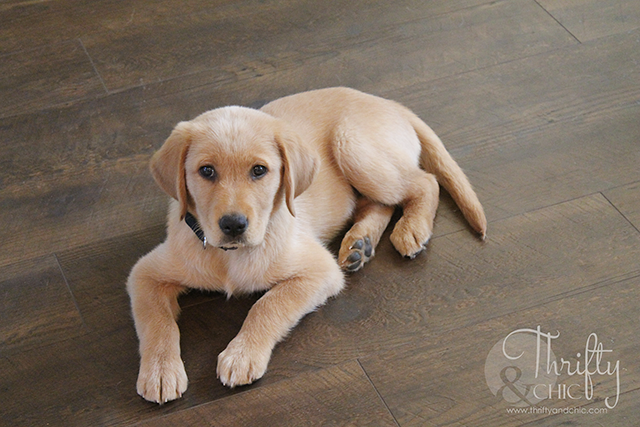 With a lot of research done, we realized how much more durable laminate is when you have kids and pets. It is also more water resistant. 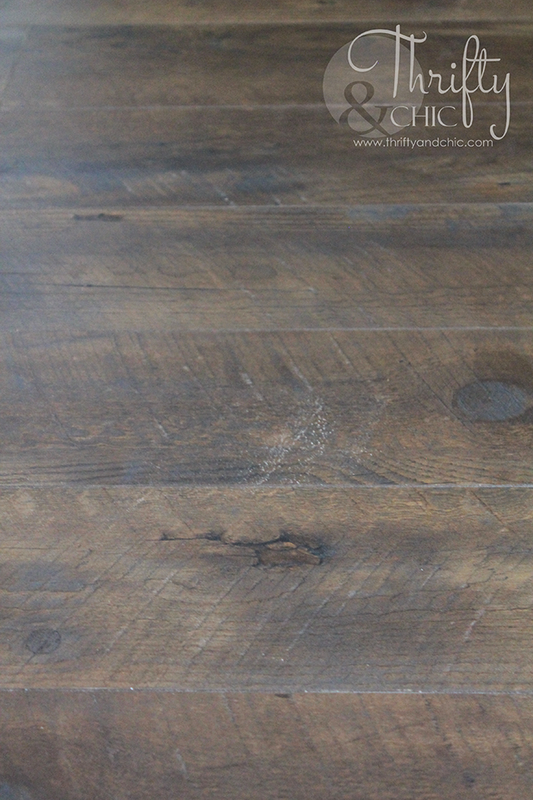 The positive about hardwood is the fact that you can refinish it. But, when weighing the costs, I could tear out and redo the laminate flooring for much less than even refinishing the hardwood. 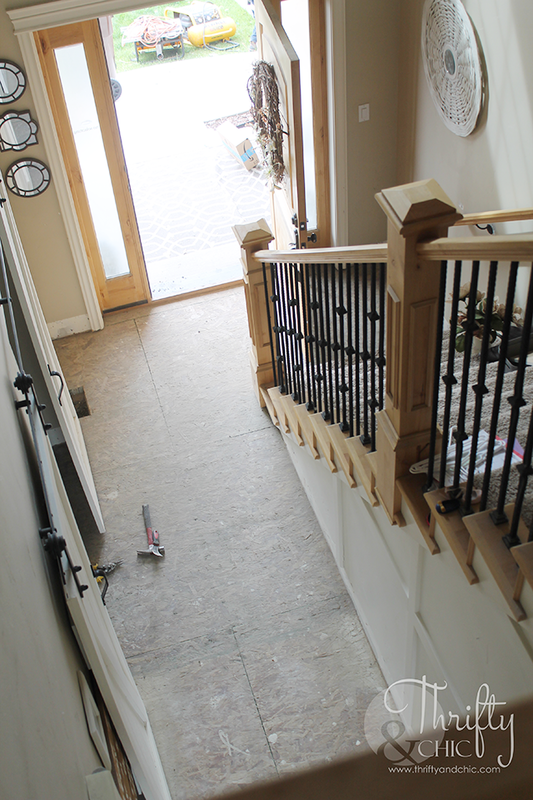 Plus, the hardwood costs about twice in materials and installation. So, in the long run, and short run, it made complete sense to do laminate. Also, laminate these days doesn't look anything like the laminate from the 80's or 90's. They come hand scraped and contain different variations just like real wood. We are so happy with the finished product! We did choose to use quarter round instead of tearing up all the molding for reasons mentioned before. 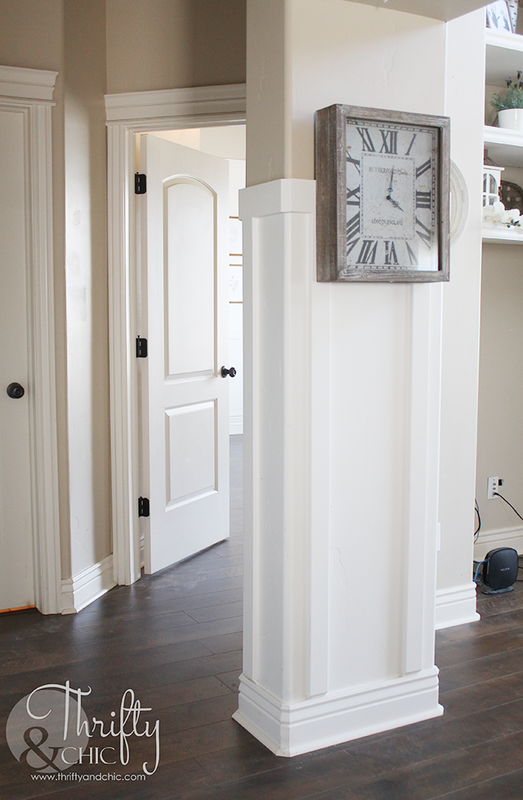 I actually love the quarter round, it extends the baseboards and makes them look even larger. As for the product we chose? We bought it from Home Depot. It's from The Home Decorator's Collection and the color is Medora Hickory. I loved the greys and different browns throughout it. Also, it is hand scraped so it looks like real wood and not laminate. We did order one case of it a few weeks before we ordered the full load. I moved the pieces throughout the house to see how it would look and if it was a good color. 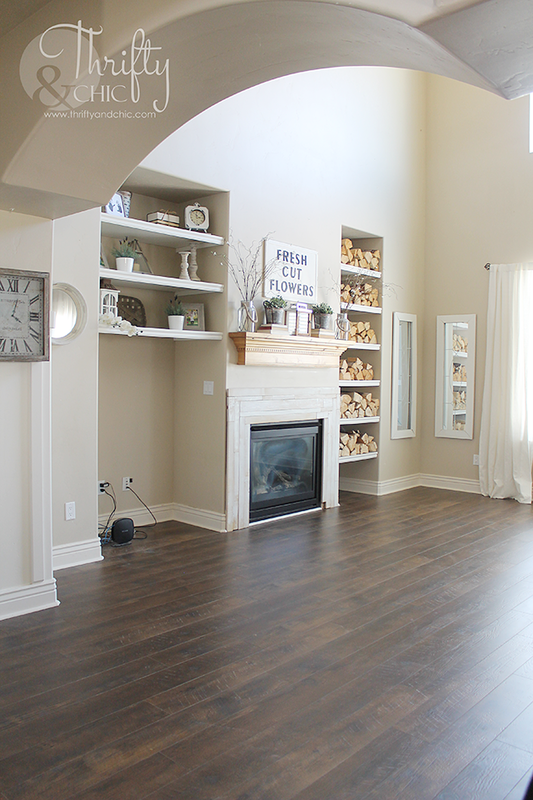 I would recommend you do this no matter which flooring you get! The samples at the store are so different from the actual product most of the time. The two samples we got for this looked like they came from different floors all together! I do have to admit, it's been a lot of getting used to. 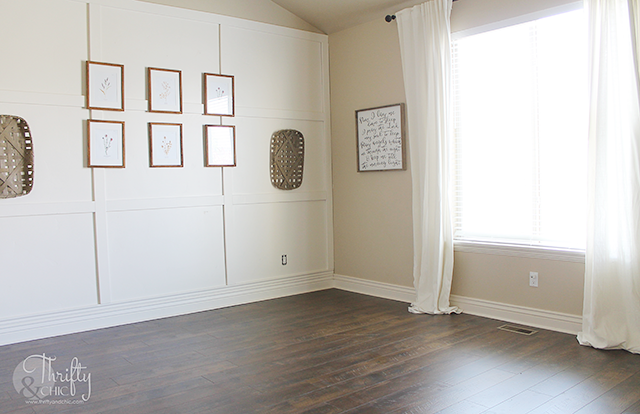 I was so used to having my whole house white and beige, so having the floor so dark has thrown off my groove! 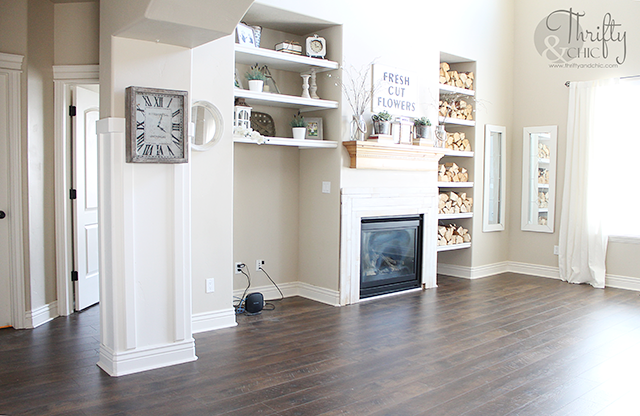 :) I do love the floors, I'm just not used to it :) But, how my baseboards and walls contrast off of it, it just looks beautiful! Here's the entire living room again. It took me like an extra day to want to put my furniture back on this. I just loved looking at it! And here it is in the master bedroom. 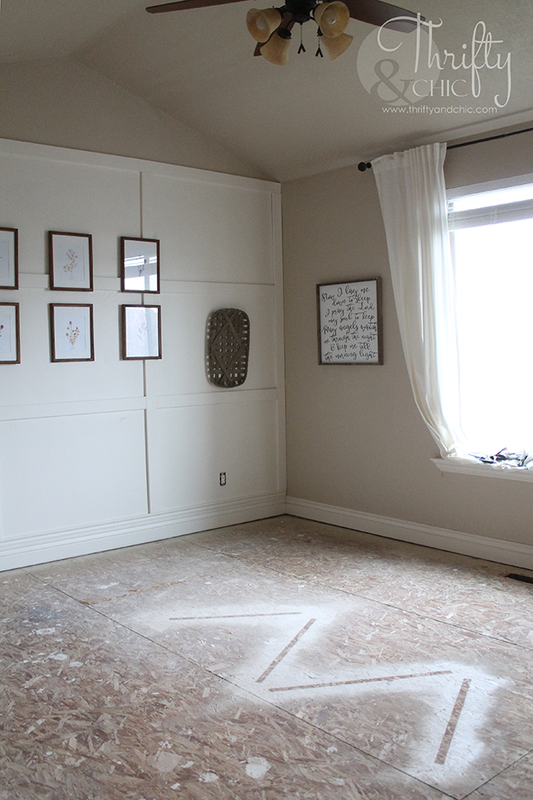 Truthfully, once the rug was put down and all the furniture moved in, you can barely even see the flooring. So, I feel it was somewhat of a waste, but oh well. Our sweet Bo :) We had Bo for only a week before the flooring started being put in. The poor dog was probably so confused as to what was going on! But, I love having this with him. It has helped the potty training process, just for the fact that it's easy to see and easy to clean! 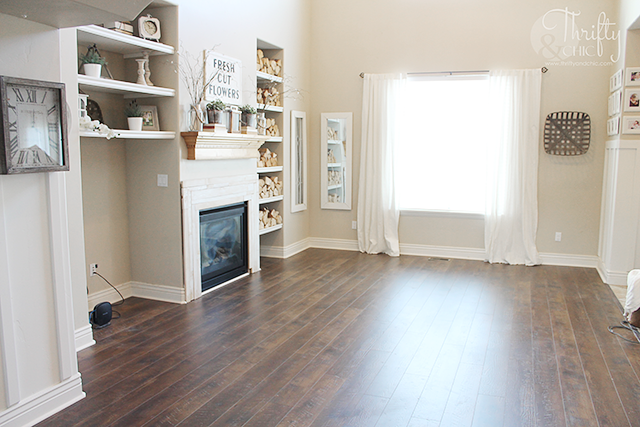 Love your new floors and you will love how easy they are to clean and keep. They look gorgeous. Ohhhh! Very very nice! I wish you to enjoy it so much! And the dog... so cute! What is the carpet color you used? How is this holding up? Did home depot install or did you guys install? Love the color of floors. After reading your post, I ordered a carton of the exact same floor from Home Depot to try it out in our family room. Just wondering how it has stood up with a dog? Any scratch marks from his nails? That is my only concern with our dog. Did you have Home Depot install it? It's holding up great! It's only been about 6 months so I hope it would for at least that long :) The question will be years from now. The only thing I would change is maybe get a lighter color. Dirt shows up on the dark color easily and drives me mad. Even seconds after sweeping and mopping.